Swimmer's ear is an inflammation and infection in the outer ear canal that runs from the eardrum to the outside of one's head. This is often caused by water that remains in the ear after swimming, creating a moist environment that aids bacterial growth. Using too many cotton swabs, putting fingers or other objects inside the ear can also lead to swimmer's ear. The most common cause for swimmer's ear is bacteria invading the skin inside one's ear canal. 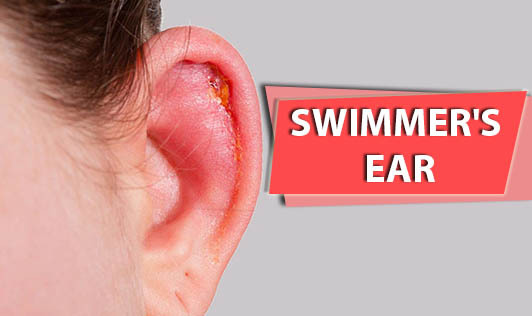 The symptoms and signs associated with Swimmer's ear depend on the progression of the infection. Swim in a clean pool and watch out for signs alerting high bacteria counts. Keep your ears dry by drying only the outer ear. Wipe slowly and gently with a soft towel or cloth. Don't use foreign objects in your ears, such as paper clips or hairpins, these can irritate the skin inside the ear and break the skin. Protect your ears by using cotton balls inside your ears whenever you're applying products such as hair spray or hair dyes. If you're experiencing severe pain and other signs and symptoms of swimmer's ear, contact your doctor immediately!